An Indiana National Guard armory that has been the site of many Indiana State University homecoming dances and other events is now part of the Indiana State campus. Maj. Gen. Martin Umbarger, state adjutant general, turned over the keys to Terre Haute's Ninth Street Armory to university President Dan Bradley Thursday (Jan. 15) in a ceremony that marked the end of an era for the building, dedicated in 1935 and located just north of Hulman Center on the east side of campus. "It's a bittersweet day as we say goodbye to a facility that has served Terre Haute, Vigo County and the state of Indiana for nearly a quarter of a century. Our thanks go out to all the soldiers who have served in this building and who have helped maintain it," Umbarger said. 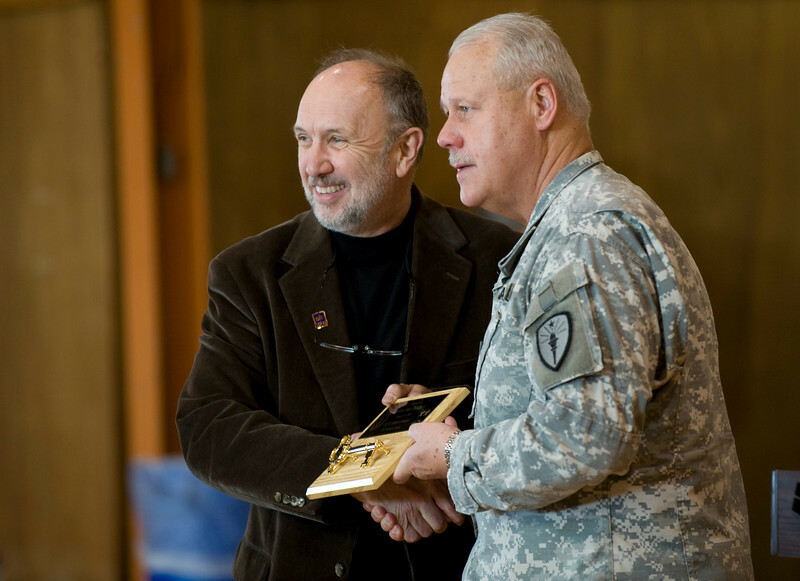 "On behalf of all of us at Indiana State University, we express our appreciation to the National Guard and the state of Indiana for the gift of the Armory facility. The Armory is an important addition to our university due to its strategic location within our traditional campus boundaries," said Bradley. "As part of the strategic planning process we currently have underway, Indiana State is conducting a land use and facilities assessment. The Armory will now become a part of that process so that we can determine the best use of this facility for the benefit of our students." Noting that many faculty, staff, students and alumni in the National Guard were present for the ceremony, Bradley said the university is proud of all of those in the ISU community who have served. "We also continue to work to improve our veterans' programs, including the semester tuition waiver for guard members and others in the military returning from active duty. We are pleased that some guard members are already taking advantage of this new program," he said. The Ninth Street Armory is among seven around the state that have closed during the past two years in conjunction with a National Guard restructuring which took into account changing demographics around the state, resulting in armory closures in areas where recruitment was down and in locations such as Terre Haute which were served by multiple armories, Umbarger said. Another armory remains open on Maple Avenue adjacent to Terre Haute North Vigo High School and Terre Haute International Airport-Hulman Field is home to the 181st Intelligence Wing of the Indiana Air National Guard. 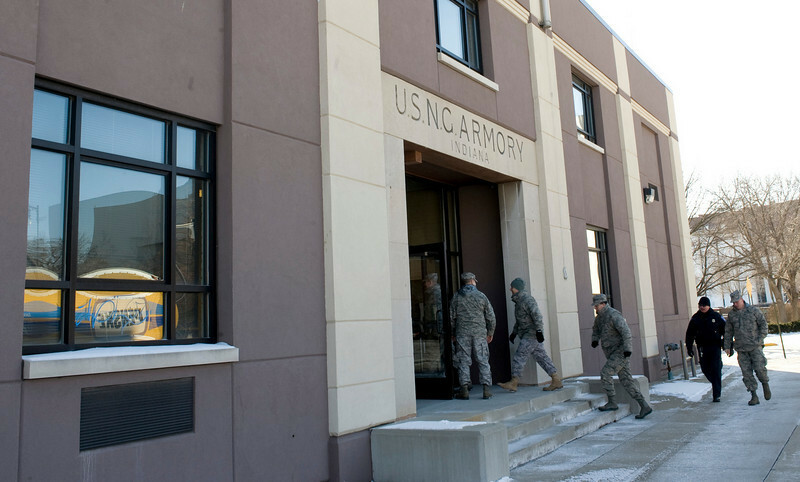 A recent restructuring which saw the Intelligence Wing replace the former 181st Fighter Wing enabled a chemical unit formerly housed at the Ninth Street Armory to move to the airport, Umbarger noted. In addition to Umbarger, other officials on hand for the ceremony marking the transfer of the Ninth Street Armory included state reps. Clyde Kersey of Terre Haute and Vern Tincher of Riley and Terre Haute Mayor Duke Bennett. An Indiana National Guard armory that has been the site of many Indiana State University Homecoming dances and other events over the past 70-plus years is now a part of the ISU campus.